Update - TPLF, which was paralyzed by a popular revolt in Gonder over the weekend, has been on a killing spree in Oromia region at about the same time. Agazi forces opened fire on Saturday and killed at least six people and wounded 25 in Awodai town, Hararghe. TPLF/EPRDF offices are reportedly burned down. Despite killings, anti-government protests in Oromia show no sign of abating. GONDER (July 30) - Defying a government order not to go ahead with a protest rally, Gonder not only held a massive protest rally but also rekindled the spirit of Ethiopian Unity by condemning government killings in Oromia. A bedrock of Ethiopian patriotism, Gonder's solidarity with Oromia is a slap in the face of TPLF, because TPLF, the architect of ethnic federalism [aka ethnic hate], had thought its politics had brought Ethiopia to its knees, and the people would never rise up to challenge it. TPLF, a group of thugs whose job prior to the 1991 change was no more than serving as foot soldiers for Eritrean organizations, had preached ethnic hate and division for 25 years but its gambling backfired on Sunday in Gonder and could be the harbinger of TPLF's demise. Knowing that the Ethiopian flag has been a symbol of unifying force, TPLF had tarnished the sacred symbol by placing a huge, ugly star at the center of the flag. Ethiopians didn't accept TPLF's flag, but have been banned by the government never to resort to the original Ethiopia tricolor of Green, Yellow and Red. On Sunday, patriotic Gonder kicked TPLF in the rear and held the genuine Ethiopian flag high in the air throughout the day. The protesters also chanted that the imprisoned Welkait Tegede committee men should be released without any preconditions, or else face the consequences. 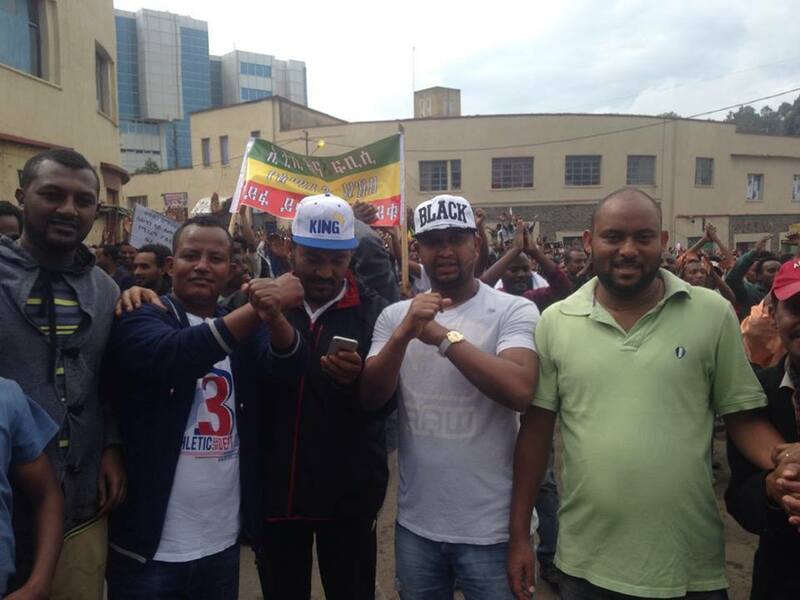 Marchers also denounced ongoing killings in Oromia, and vowed their struggle wouldn't stop short of securing what it takes for the reign of democracy, freedom and justice in Ethiopia.